Smarter, easier and more powerful, CLARISONIC SMART Profile is a dynamic skin cleansing system that not only removes long-wearing makeup 11 times better than hands alone allowing creams and serums to work more effectively*. Powerfully yet gently lifts dirt and sebum to clean pores unlike any other method of skin cleansing. Cleansing is a fundamental first step that is often overlooked or undervalued. A patented sonic frequency of more than 300 movements per second that cleans the skin in just 60 seconds. It provides superior exfoliation for accelerated skin renewal on all body zones. It is created with SMART technology, which enables the SMART Profile device to read the two new SMART-enabled brush heads and automatically adjust timing and power for the optimal head-to-toe cleanse. Featuring four speeds, an intuitive user interface and enhanced battery life, it cleanses smarter, works easier and gives you more powerful results. The different speeds are designed to allow for different sensorial preferences and personal customization. Changing the speed is an adjustment of how far left and right the brush head oscillates within the same amount of time. When the Body Brush Head is attached, the Clarisonic PLUS handle switches to Body Mode and the T-Timer® is automatically set to three minutes. Pressing the speed button while in Body Mode toggles between constant and pulse settings. The pulse setting is great for the head/neck area and provides a different sensation than the constant setting. 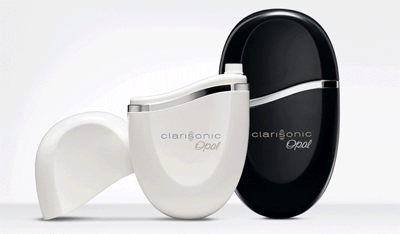 Clarisonic Opal is a sonic micro-massage that gently infuses your favorite serum into the outer layers of the epidermis, hydrating the skin for immediate results. Developed by the lead inventor of the Sonicare® toothbrush and Iaunched to dermatologists and plastic surgeons in 2004. The Clarisonic Pedi is 10 results in 10x Smoother Feet than manual buffing! Thoroughly transform rough, dry heels and toes into softer, more beautiful looking feet in just minutes a day. Designed to smooth and soften dull, rough foot skin. This textured, metal disc works with the sonic Pedi device to slough away rough, dry areas without damaging the health of the foot skin. A combination of short rigid filaments and longer, flexible filaments work together to effectively exfoliate and buff dry, damaged feet..